This blog post is part of a series of quotations by Oliver Edwin Baker, from the book, Agriculture in Modern Life, which was published in 1939. Mr. Baker's writing is loaded with various agricultural statistics, but interspersed throughout are many pithy observations that I think are worth reading and ruminating on. It is clear to me from O.E. Baker's Wikipedia biography that he was a well-educated intellectual, but he was also a deliberate agrarian, and a Christian-agrarian at that. And the collected quotations I'm presenting in this multi-part series could be titled, Writings of a Deliberate Agrarian, by O.E. Baker. "We need to understand that every civilization in the past has undergone decline, and the reading of history suggests to me that this decline has been associated with the growth of cities, the urbanization of the social ideals and economic institutions, the decline in the integrity of the family and then of population, and the spread of poverty and dependency among the rural as well as the urban people." "In the cities the family is gradually failing to function as an institution for the reproduction of the race, the training of childhood and youth, and the support of the unfortunate and the aged. As the family fails to function the State has had to step in and carry much of the load. Take the relief of poverty, for example. In pioneer days, it was felt to be a family responsibility, and still is quite generally among the middle and upper classes. Then as churches were organized, the church members felt a sense of duty in regard to the needs of the less fortunate families. Those not provided for by the family and church were helped by the township trustees. Later this task was taken over by the county officials and "poor farms" were established. Still later the state governments established various institutions to care for those unable to care for themselves. Finally, during the last decade, it became imperative that the federal government shoulder most of the load." "Probably most of the farmers a century ago were part-time farmers. They were carpenters, masons, shoemakers, merchants, teachers, ministers, doctors, lawyers. Washington, Jefferson, Madison, and Monroe were farmers and their wives manufactured or supervised the manufacture of the home-produced linen and wool into clothing, bedding, and other household fabrics. 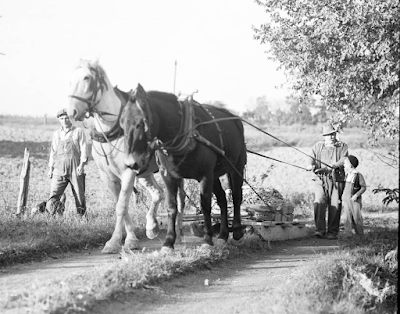 Gradually during the century preceding 1930 the towns and cities took away many functions from the farm family. First spinning and them weaving were transferred to the factory, then the making of shoes and clothing and many other things. This process persists." "A quarter century ago the farmers sold several hundred million dollars worth of horses and mules a year [to city people]. In 1936 and again in 1937 the farmers paid city people nearly a billion dollars for power (tractors, trucks, automobiles, gas, oil, etc.). A large item of cash income has been changed into an enormous item of outgo." "By advertising and in other ways the consuming public has been persuaded to pay high prices for many products originally of small value. Wheat costing 2 cents a pound is processed into puffed wheat and sold in a fancy package at 20 to 30 cents a pound." "The future of the nation appears to lie largely in the hands of the rural people. Can they resist the disintegrating influences of certain aspects of urban culture and retain their familistic philosophy? " "The State has accepted science, and in Russia, Italy, and Germany it has assumed also the ethical leadership of the people. The universities, as well as the elementary and secondary schools, are arms of the State. The youth are organized to serve the State. There is little left for the voluntary associations, such as the church, the fraternal orders, and the agricultural societies, to do. Individual freedom and the opportunities for the growth of personality are seriously impaired. Is this to be the ultimate result of the progress of science in America also?" "Poverty is bearable, indeed it may be associated with happiness and pride, if there be basis for belief that it is temporary, and that by hard work and thrift, wealth can be acquired. Many of the pioneer farmers were poor and happy and proud, for the United States was a land of opportunity, and the people possessed the spirit of confidence in their institutions, in there own future, and in that of the nation."